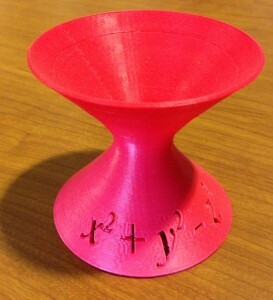 My first successful print of a quadratic surface was a hyperboloid of one sheet. 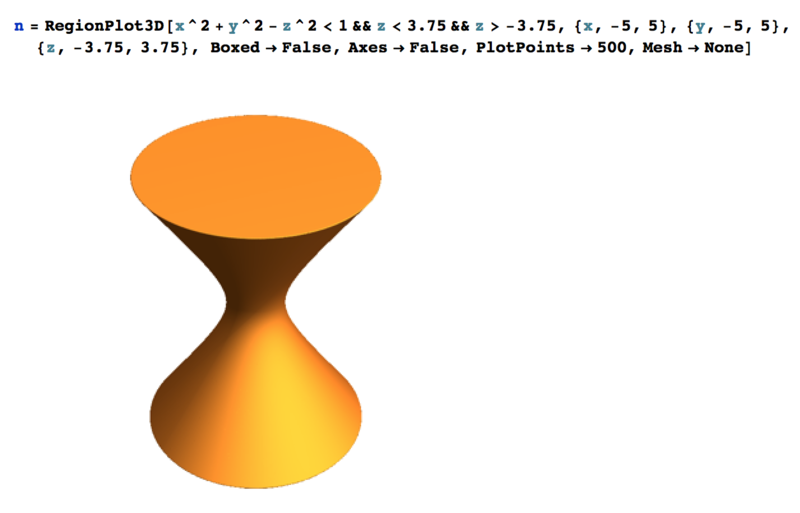 I began this project by creating a solid hyperboloid of one sheete in Mathematica. I didn’t like this object since it was a complete solid and not the surface I was trying to create. To make the surface I originally attempted to import a Mathematica file of the surface into Cinema 4D and then give it thickness. This quickly became a nightmare to deal with. I had to be extremely careful about how many plot points I used in Mathematica because too many created too many polygons. These polygons also overlapped and so when I tried to extrude them to give the surface thickness the normals were off and it resulted in a very jagged surface. After spending hours trying to work with my Mathematica file I decided to try to create the surface from scratch in Cinema 4D. 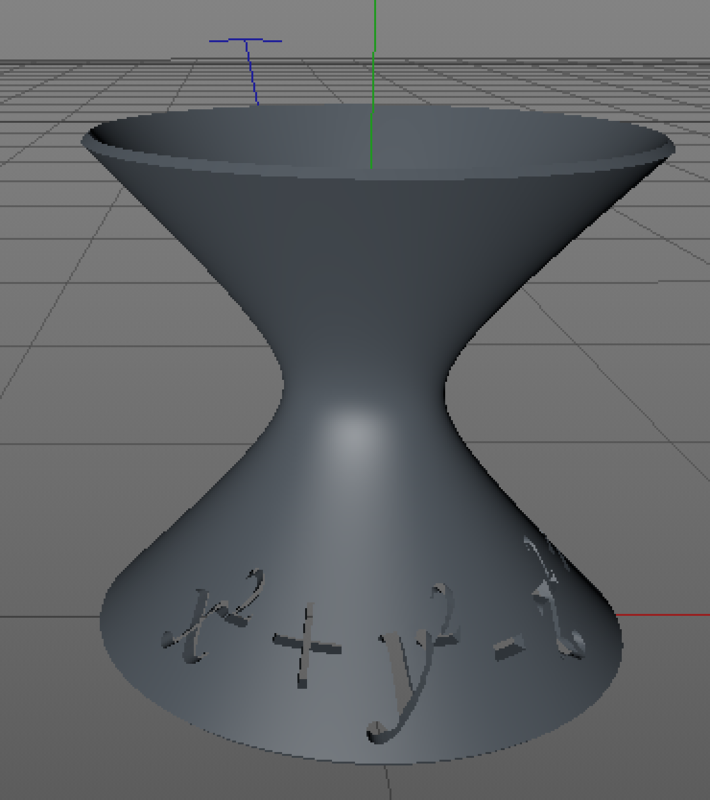 In order to do this I used a ‘formula spline’. In Cinema 4D ‘formula splines’ are created using parametric equations. I used the equations \(x(t)=sinh(t), y(t)=cosh(t), z(t)=0\). I then rotated this spline 360 degrees using the Lathe tool. I then optimized the polygons in order to fully connect the object where the spline’s rotation began and end. Once this was done I was able to extrude the polygons to give the surface thickness using the polygon extrude and being sure to add caps to my extrusion. One this was done I had my object complete. The next step was to add equations. Using the instructions for how to put equations on solids I created my equations. In order to put them on the solid I used the bend tool in Cinema 4D. Using this tool was very difficult and took a lot of playing with to make it look good. The first thing I had to do was fit the bend box and rotate it in order to bend my equation correctly. When I went to bend the formula to fit my object, I found I needed to align only the first part of the equation on the left hand side with the surface (and not the center of the formula) since the bend tool bent the equation from the left and not at the center. 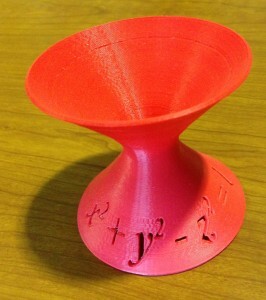 The first time I printed my object I realized the equations I had put on my object were far too small. I went back to my Cinema 4D file and make them bigger to get my final object! This object can be found on Thingiverse here. 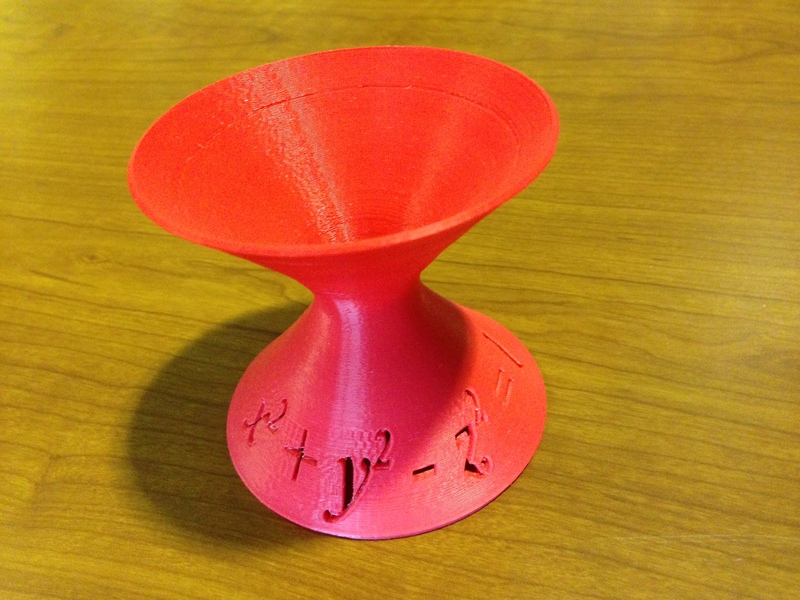 This entry was posted in 3d Printing and tagged Hyperboloid of one sheet, Multivariable Calculus, Quadratic Surfaces by jaeklee16. Bookmark the permalink.